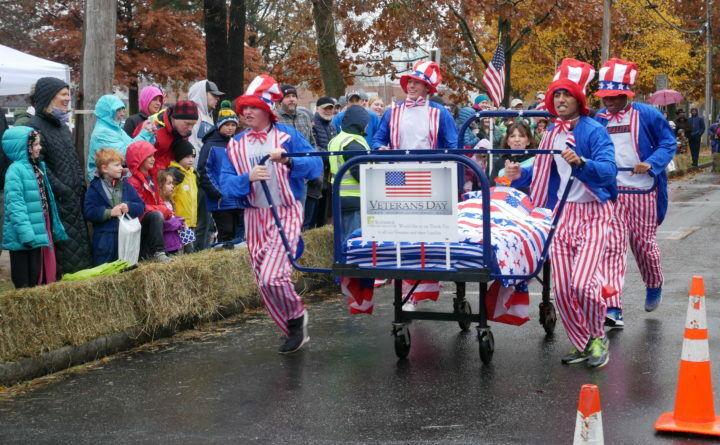 The Brunswick Downtown Association's team "Blazing Glory" took home the prize for the speediest contenders at the 8th annual Rolling Slumber Bed Races, held on Saturday, Nov. 10 in downtown Brunswick. The chilly rain that fell on Saturday morning couldn’t put a damper on Brunswick’s eighth annual Rolling Slumber Bed Races. The event, in which teams of costumed participants lace up their sneakers and then do their best to push a bed on wheels down a downtown street and toward the finish line, coincides every year with Brunswick’s Early Bird Sale. And even though the weather was dismal, the spirits of bed racers were not, according to Patti Spencer-Yost, marketing and communications director for the Brunswick Downtown Association, the group that sponsors both the race and the sale. For many Brunswick retailers, the Early Bird Sale is the best business day of the year, and the bed race helps to bring people to town. Spencer-Yost estimated that about 400 people braved the elements to cheer on the racers. This year’s teams were organized by Wayfair, Pathway Vineyard, the Independence Association, Byrnes’ Irish Pub, O’Donoghue’s, Lowes, Sexual Assault Support Services of Midcoast Maine [SASSMM], Volunteers of America, Life Church and the Brunswick Downtown Association. The judges were Curt Dale Clark from Maine State Music Theatre, Don Kniseley of Thornton Oaks Retirement Community, Brunswick Town Manager John Eldridge and Trendy Stanchfield, executive director of the Coastal Humane Society. Participants compete for bragging rights and awards that include most creative bed design, best team spirit and fastest bed. This year, the Brunswick Downtown Association won the prize for the speediest runners, Spencer-Yost said. Brunswick isn’t the only Maine municipality to embrace quirky races. Bar Harbor has a popular annual bed race that also was held on Saturday.